Painted at Argenteuil, this is the more finished and probably the earlier of two attempts Manet made at the subject. In July and August 1874 he spent several weeks at his family's property at Gennevilliers, located on the opposite bank of the Seine to Argenteuil, where Monet was then renting a studio. Manet painted a canvas of the Monet family in their garden, a work that captures the care-free atmosphere of the period. The painting shown here depicts the purposebuilt boat that Monet used for painting many of his scenes of the Seine. He had taken the idea from the landscape painter Charles-Francois Daubigny, who had had a similar construction built for the same use. Seated in the little cabin is Monet's wife Camille, who looks on as her husband works. Beneath the shade of the awning Monet paints a scene that can be seen over his left shoulder: the river with houses along its bank and factories in the distance. To the right and in the background can be seen the more usual sort of pleasure boat found on the river. The style of execution shows the influence of Manet's younger Impressionist colleagues, and the water on the left is painted in broad, distinct brushstrokes of differing colors. However, the freedom of execution is looser than most of Manet's other works of this time and must in part be attributed to the fact that he abandoned the work, as he did the other version. 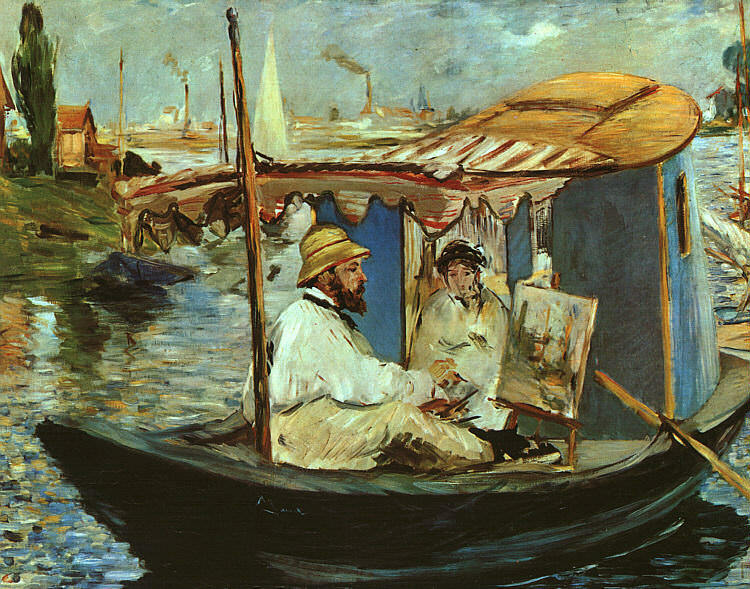 It is said that Manet was reluctant to waste so much of Monet's time by having him sit to him, and thus for his other river scenes he used models whose time he thought less precious. The very sketchy variant of this work shows the two figures more formally posed than here.